Hi all! Here's the second post in my series on all the good stuff I learned at Cosmoprof North America (CPNA) this year. If you missed my post on all things nail polish, be sure to check it out here. Stay tuned for future posts on all the non-polish things that caught my eye at the show, an overview of the new goodies to expect from the indie brands that were there and a "diary" of my stay in Las Vegas. Today I'm going to cover gel polish and extended wear systems. 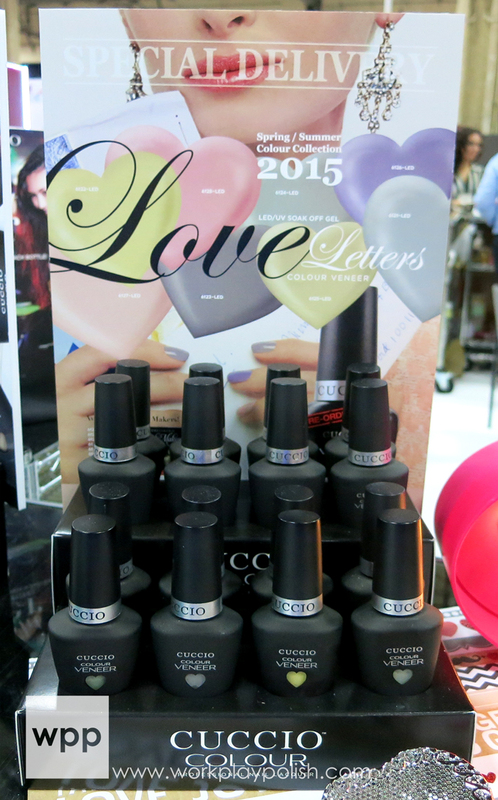 UV and LED cured gel polish were everywhere at the show. 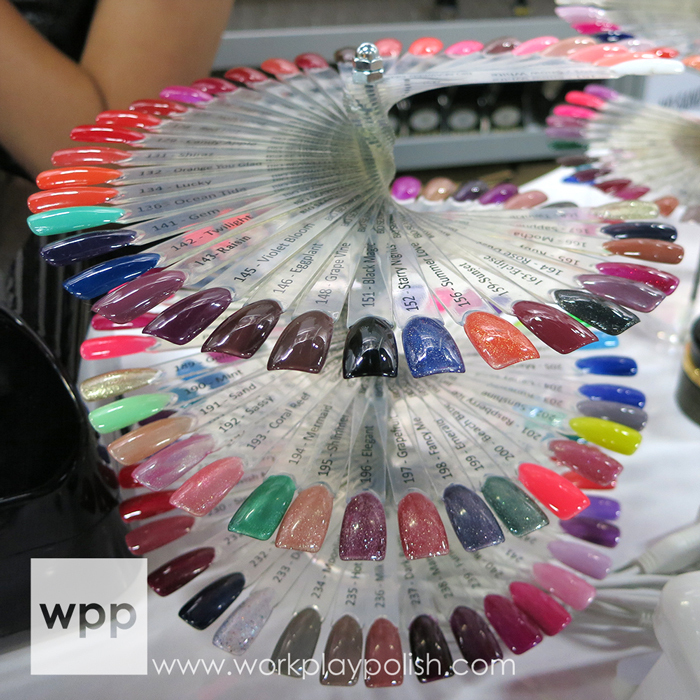 There were soooo many booths offering gel polish systems - too many to visit. Here, I'll highlight some gel polish brands which I think will most interest WPP readers (and are easiest to get your hands on). Some of these are available only to pros (I'll indicate which ones below). I figured if a pro product caught your eye, you could seek out a salon that offered that particular line. Attendees were also introduced to two new extended wear systems. These polishes are a hybrid between polish and gel. Wear time is advertised anywhere from 7-14 days and they don't require a light to cure. If you're familiar with CND Vinylux...it's the same idea. I saw two trends in gel polish: First, brands are listening to consumer requests to have both gel and traditional lacquer versions of their colors. Some brands do a one-to-one match (like Gelaze), while others do a coordinating shade with a different name (like Gelish/Morgan Taylor). 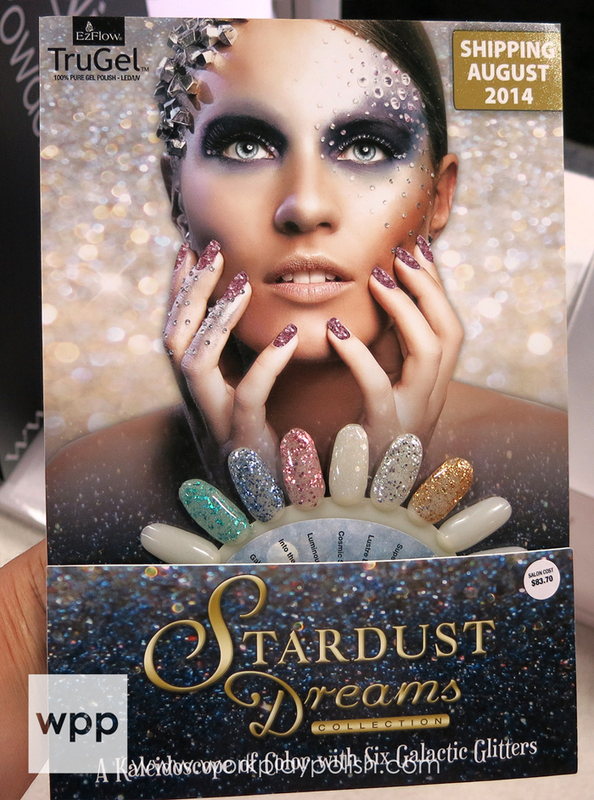 Not only are promotional collections being released with both versions, but many brands are dipping back into their core lines and developing gel matches to their best sellers. The other thing I saw a lot of was matte gel topcoat. Almost every brand that offers a gel system now has one. Bio Seaweed Gel, a Canadian company, caused a big stir among the bloggers. 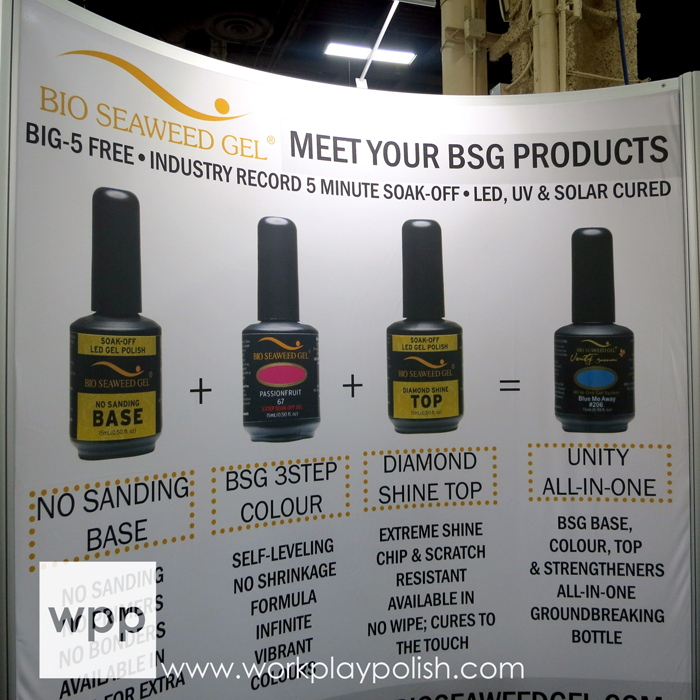 Touted as "the healthier gel polish", Bio Seaweed products are 5-free and claim to soak off in only 5 minutes! They have two different gel products. The 3STEP Colour system requires a base and topcoat. The Unity All-in-One system has everything built right in...so you literally jump right into color and don't need a topcoat (but can add one if desired). There are quite a few colors in some really pretty finishes. 3STEP Colour comes in 76 shades. The Unity All-in-One comes in 114 shades. I got some samples so I'll be sure to feature them on the blog at some point. They had racks and racks of beautiful gel nail art. Funny story, I actually visited the booth with Sarah of Chalkboard Nails (who was sporting some pretty rad gel nail art of her own) and everyone in the Bio Seaweed Gel booth totally fan-girled when they found out who she was. They handed me their camera and asked me to take pictures. They never asked for a pic with me. LOL. Their website (bioseaweedgel.com) has a list of distributors and salons. Cuccio Colour Veneer is a pro product. 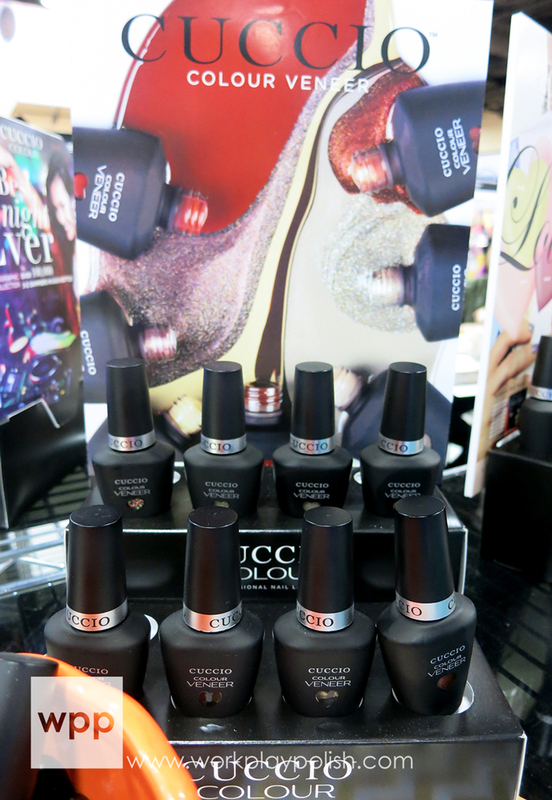 They have two new collections in the works - both coordinating with identical collections in their lacquer line. Cafe Cuccio is the Fall/Winter release. It includes deep, warm shades and a few metallics. The Love Letters Collection is coming for Spring/Summer 2015. 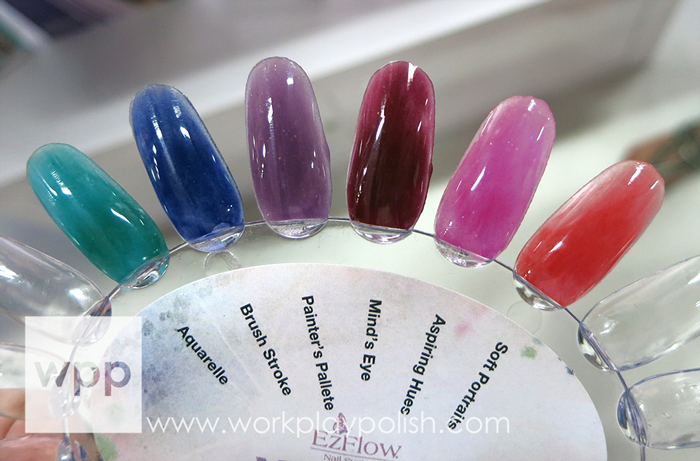 TruGel by EzFlow is another professional product. I'm super impressed with what they have available in gel! So much variety and cool nail art kits. The Summer Ringleader Collection is currently available. The Boogie Nights Collection is a set of sparkly glitters that can be used alone or as toppers. Shipping next month is the Stardust Dreams Collection. These are really pretty in person. The Mystic Collection will be released in the Fall. I love the navy blues. 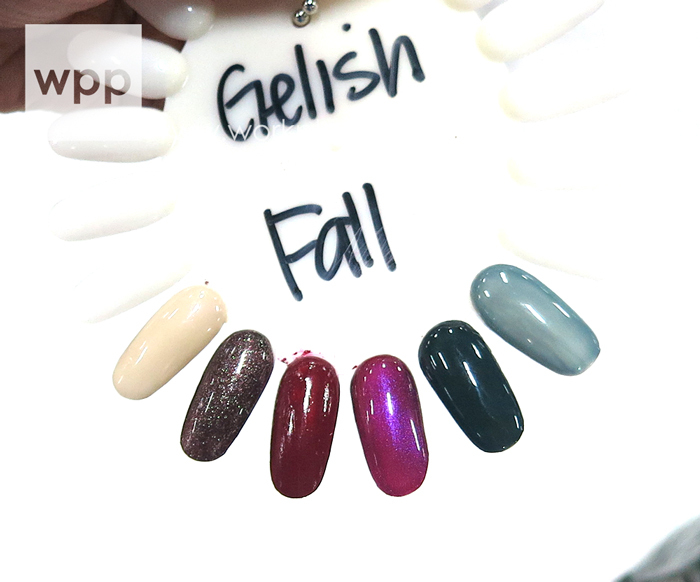 This collection would make great Fall/Winter nail art, wouldn't it? This is the Watercolor Collection. It's like the pigment is suspended in clear gel, giving the nail a really cool water-based effect. I'm so curious how easy/hard it is to achieve this look and what it looks like on a natural nail! 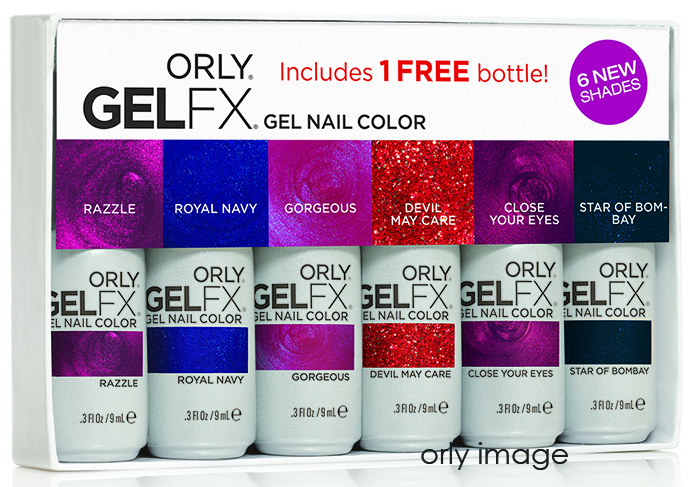 And here are a few nail art gel kits. This gel is a thicker consistency for one-coat coverage and each bottle has a fine striper brush. I wish I'd taken more pics of the nail wheels they had available because the gel art was really crisp and opaque - which is difficult to achieve with gel polish. 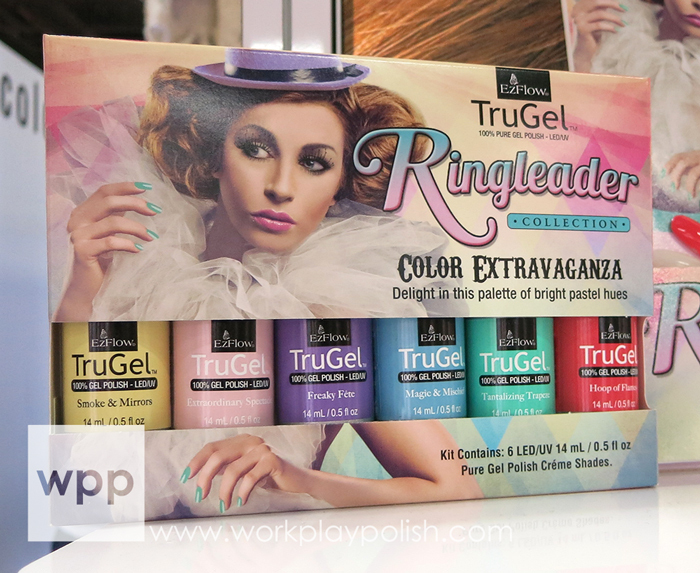 Like other gel lines, TruGel now has a matte topcoat. It's called Matte It! 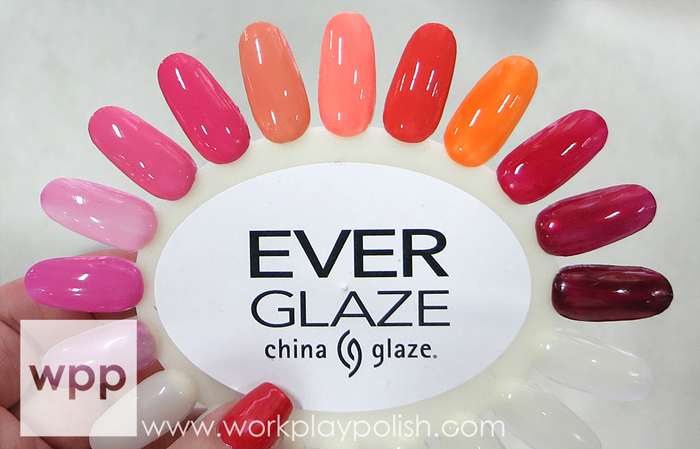 Good news on the China Glaze Gelaze front! 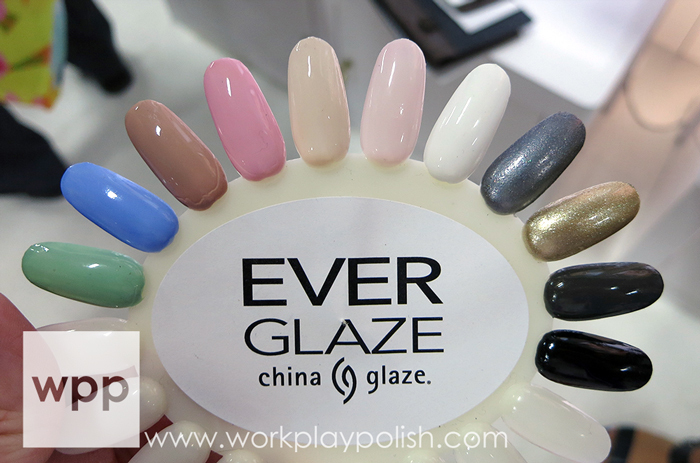 23 more shades from the China Glaze lineup will now be available in gel this November! And for my pro readers, the line will now be available in pro-sized 0.5 fl oz bottles! The mini sizes will still be available at Sally Beauty Supply stores nationwide. Below is a list of the 23 new shades. Those in RED CAPS will be be available to consumers at Sally's. I'm excited about Deviantly Daring! Gelaze also has a matte topcoat. Gelish, by Hand & Nail Harmony, is a pro/at-home gel polish system that many are familiar with. 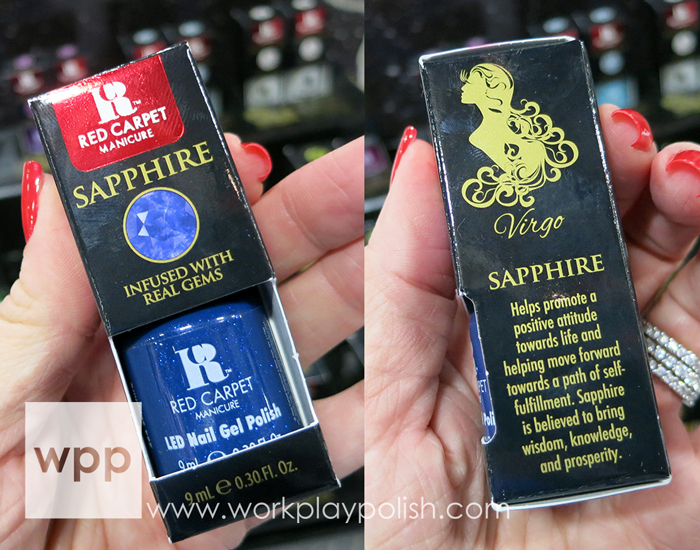 Gelish MINIS, the retail version, can be found in Sally Beauty Supply. There are lots of new collections on the horizon, but unfortunately the only one I can talk about right now is the Get ColorFall Collection. I actually have this collection already...so watch for swatches and/or nail art on the blog soon! Convenient duo packs of coordinating Morgan Taylor and Gelish shades are also available. Gelish also has a matte topcoat called Matte Top It Off. Also expect two new additions to the Trends line, Winter and Holiday Collections, of course, and a special Chinese New Year set. Lots of beautiful stuff! I didn't get a good pic of the six new colors for Fall. Below is an Orly image. The holiday collection includes four beautiful glitters and two flakies. Very pretty! New Multi-Chromatic Glazes will be available in September. They really take on a different look depending on the base gel polish. RCM is a purely consumer product and is currently sold in ULTA, Meijer and other select locations internationally. 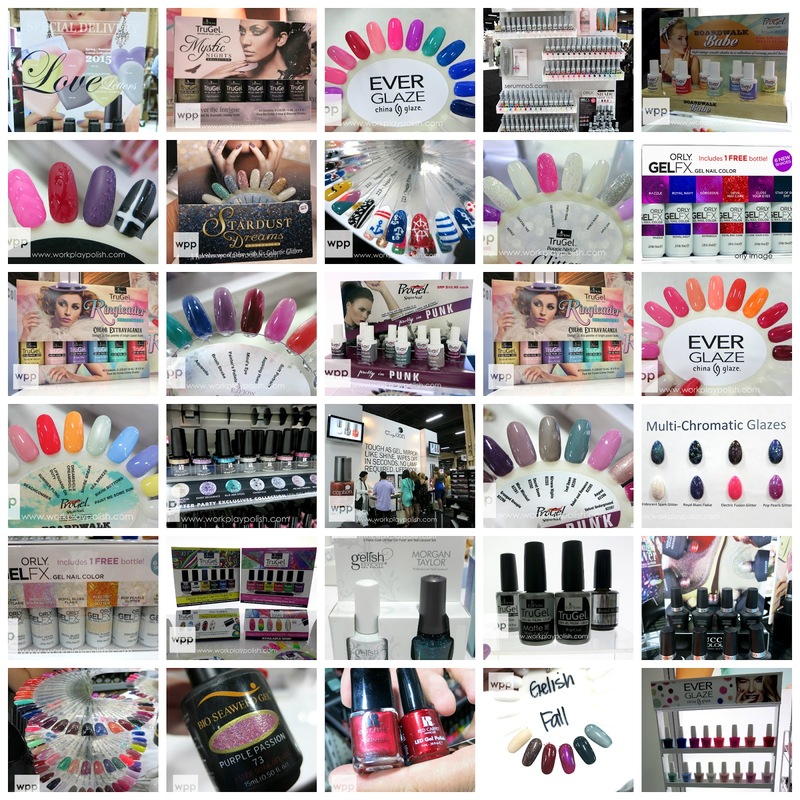 RCM has a collection of traditional lacquers, over 90 gel colors, treatments and nail art kits. In 2015, they plan an extension of their nail art offerings, including one called "Rock On" which will have studs (all kits include everything you need to create the look). They actually have how-to videos for doing nail art with gel, so check those out here. 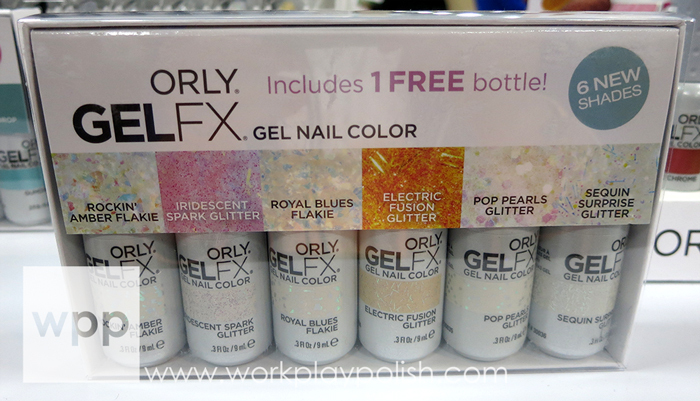 The After Party Exclusives are really chunky glitters which I think are fun in gel because you can still achieve a super smooth, shiny finish with gel topcoat. RCM also releases promotional collections. Their summer collection called Sweet Indulgence is in stores now. Each package contains an inspirational message that can apply to anyone, regardless of their birth stone. These will retail for $11.99. Here's September...mine! 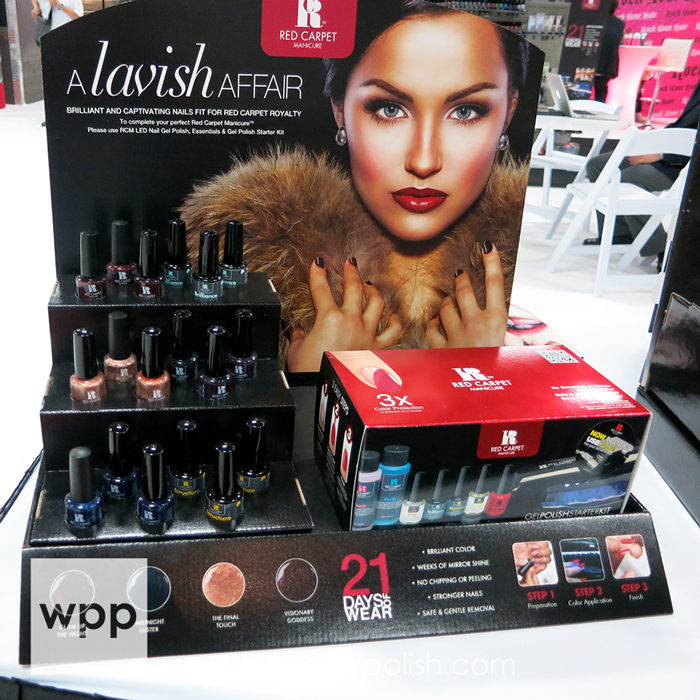 This is their Fall release called A Lavish Affair which will be available in September. Here's RCM's matte topcoat called Mattify. 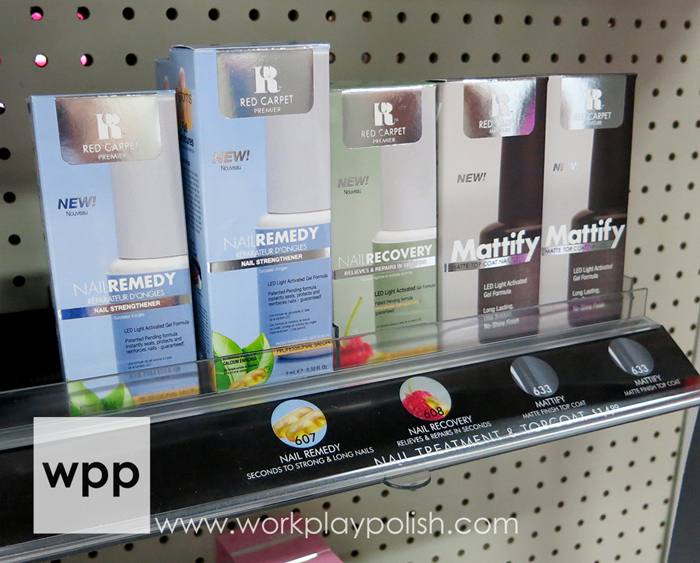 They also have a line of fairly new gel nail treatments called Nail Remedy and Nail Recovery. These are the only light cured treatments currently on the market. RCM will be releasing a new pro light in the next few months. It's a full five-finger light - which is really convenient. Currently 18 traditional lacquers have a gel polish counterpart (Glitz and Glamorous is pictured below). That number will be expanded in the coming year. 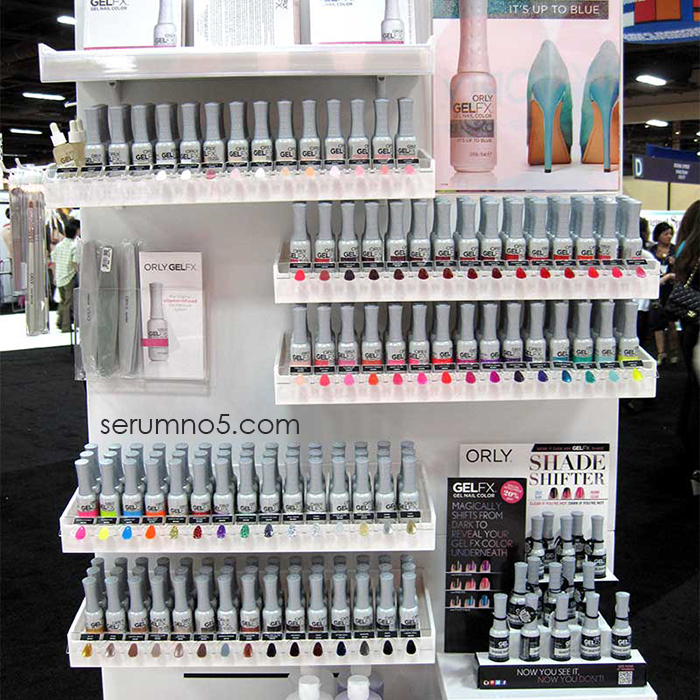 SuperNail ProGel is a pro-only brand. I'm including it here because I think the collections are fun. Boardwalk Babe is the Spring/Summer Collection. Pretty in Punk will be available in Fall. 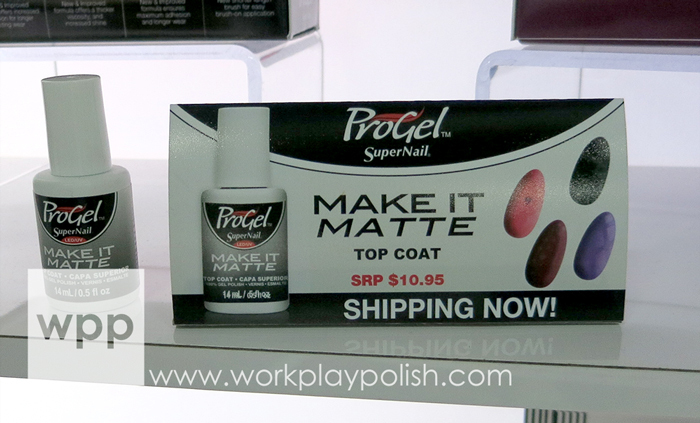 The ProGel matte topcoat is called Make it Matte. Here they've used the matte and shiny topcoats to create some subtle nail art. Ever Glaze was one of the bigger surprises of the show for me. 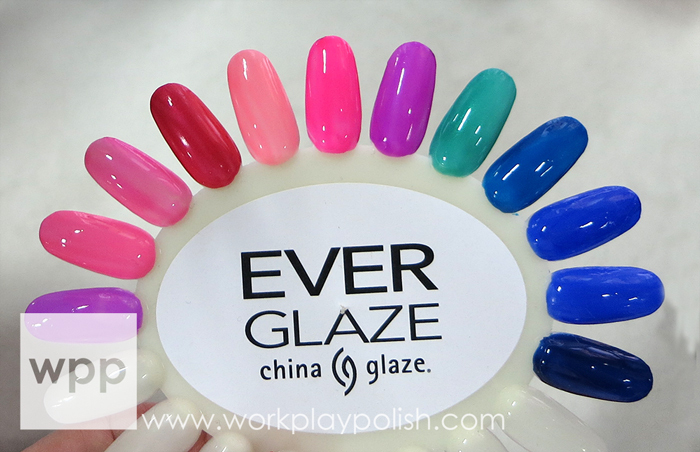 This new invention from China Glaze boasts 7-days of wear with no lamp. It's a system that includes a prepping step, the color (which has the basecoat included), and a topcoat which hardens with natural light. It's designed for the girl who wants to keep her polish on longer, but doesn't want the commitment of a gel polish. It can be removed with acetone or non-acetone remover. The line includes 36 brand new shades that will launch in early 2015! (So they don't match any existing China Glaze or Gelaze colors.) They aren't named yet, but here are the initial color wheels. There are cremes and shimmers/metallics but no glitters. I asked if they were coming and was told they just hadn't pushed development in that direction yet. I got the impression they would be coming. Caption is a new extended wear product launched by Young Nails at CPNA. I was excited to see what the buzz was about. On the first day, I had an appointment to get a Caption manicure while Greg Salo, president of Young Nails, explained the features and benefits of the line. A crowd formed around the booth during most of the show. The line includes some really amazing colors. There are 60 core shades and 18 Top Effects. I know we've all seen a lot of toppers, but these were really unique. There are glitters, shimmers and shades that give an almost metal finish. I was so caught up in getting the details straight, that I didn't take many pics! Head over to Beauty Judy's post here. She took great photos of the swatch sticks and the mani process. Here's me with Greg right after my manicure. I chose a deep purple, Hello You Fine Thing. On my accent finger, I got a black base (this black is soooo inky black!) with Feeling Feisty as a topper. So what's special about this line? It's formulated with LacQ3 technology, a proprietary blend of volcanic glass, shellac and nail strengtheners that's designed to improve the health of your nails over time. It forms strong, quick drying, highly pigmented layers that look, feel and act like a gel, but are air-cured and removed like regular nail polish. He described the initial finish as a "memory foam" that will recover from dents and scratches until it's fully cured. Unfortunately, as soon as this picture was taken, I aggressively jammed my hand into my bag and destroyed one full hand (my fault!) But I'll be getting samples to try, so I'll be sure to report back on application and wear time. The line will be available pros in September and will be the first Young Nails product that can be retailed by salons to clients for use at home. So there's my rundown on all things gel polish and extended wear. I'm really getting into gels lately - especially with the nail art options. And I'm intrigued with the extended wear lines since I don't always have time to soak. Anything you're especially interested in? Let me know in the comments.